Hope you are all good? I'm in a super good place with my blog at the moment and I'm really feeling the buzz again to get lots of fab new content on the blog. It's definitely become harder with blogging involving at the speed of light, but I always remember why I started this whole thing in the first place, which definitely helps to ground me during my low points. Today I'm going to be writing about a brand called Odacité, which until recently was completely new to me. However, their Eye Contour Serum has got me totally hooked and every other eye product has pretty much been put to the side. I hope you enjoy this review lovelies and I would love to hear from you in the comments section below. In 2004, Valerie Gradury the founder of Ofacité was diagnosed with breast cancer and felt an urgent need to reinvent her lifestyle and eliminate toxins from her day to day environment and also from her diet. Odacite was born in 2009 and consists of an enhancing collection of pure plant serum concentrates all rich in skin-essential nutrients. The Odacité Eye Contour Serum is Specially formulated to strengthen the delicate skin around the eyes, Odacité's Eye Contour Serum is packed full of conditioning plant extracts and bio-actives. Key ingredients include baobab oil - rich in Vitamins A,E,F and plant sterols, which help to combat primary signs of ageing, by improving elasticity, as well as sarsparillia, palmarosa neroli and lavender oils, which banish puffiness and brighten darkness. I actually received this as part of the Cult Beauty Summer Goody Bag, which I qualified for after getting a little spendy with Kypris products. I was so impressed to see a full size Odacite Serum after reading a few reviews about their miraculous formulations, so do I like it? The answer to that is quite simply yes! I love it. Every evening I do my usual skincare routine and as soon as I get out of my steaming shower or bath I reach for my facial oils including the Odacite Serum, which has genuinely transformed my under eye area. 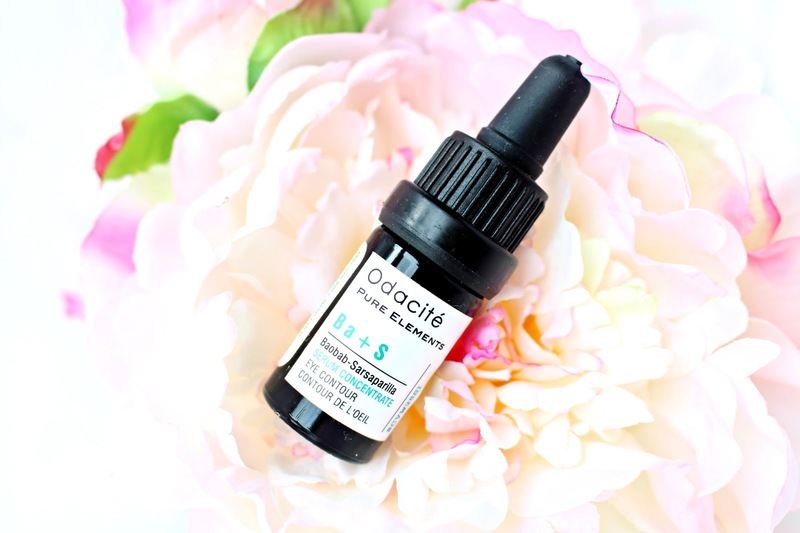 To be honest, I've never really come across an "Eye Oil" as such before, but nothing has smoothed, soothed and helped to eliminate puffiness and darkness like the Odacite Eye Contour Serum. For £33 you get a teeny 5ml vial, which is actually full size. However, true to form this in an oil and a little goes a long way. One small drop does the job for me evening and first thing in the morning. Odacite have a beautiful array of other oils that target skin specific concerns, they can also be mixed in together or with your daily skincare products to create the ultimate skin elixir. 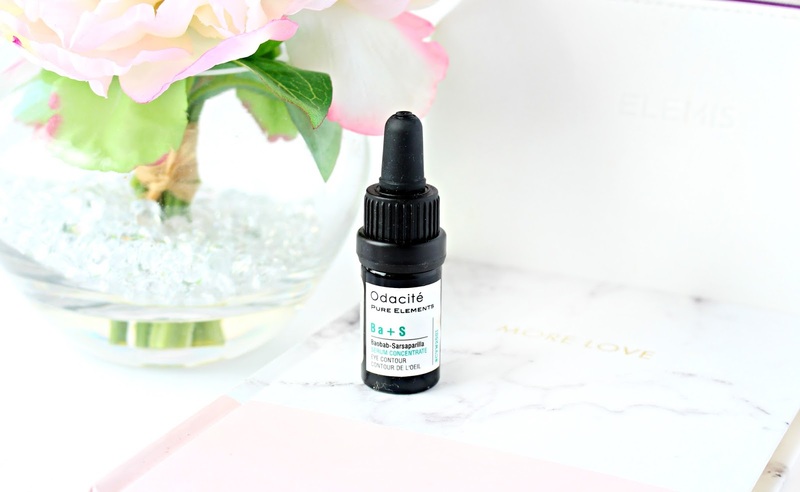 I'm pretty head over heals with this one and love that Odacite are a small and natural brand that really focus on the good stuff! Have you lovelies tried any Odacite Concentrates? Hope you are all well? If you're like me then a base product is the key part of any make-up look and despite being obsessed with lipsticks and blushes, if my base isn't right my face isn't right! Back in August I decided to treat myself to a foundation that I had tried in sample form and really liked! It was the Clinique Beyond Perfecting 2-in-1 Foundation. I've been using this for almost two months now and it's been my go to foundation for pretty much every occasion. I hope you enjoy this review and I would love to hear from you in the comments section below. 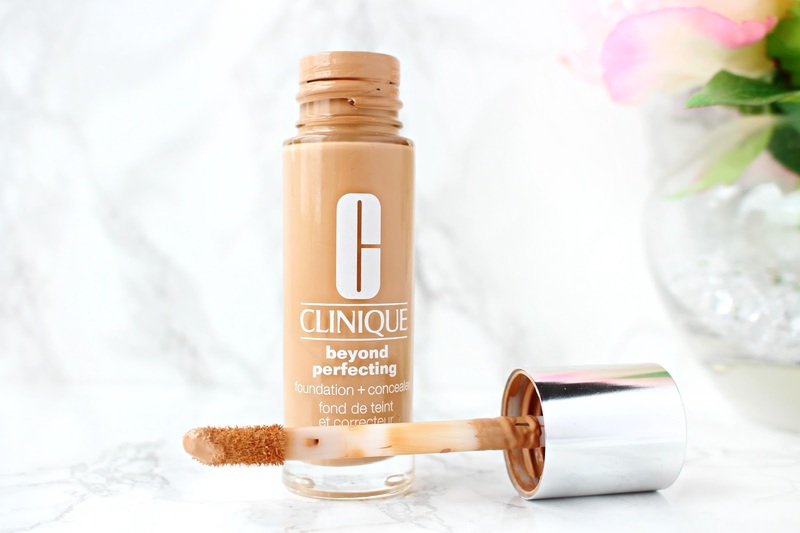 The Clinique Beyond Perfecting is a foundation and concealer that is designed to perfect your look with a long lasting yet lightweight formula. It is also oil free, which I really like in a foundation, especially as my morning moisturiser is oil free also. The packaging is pretty interesting for this foundation, but I do really like the large doefoot applicator, which means you can dot this on your face without getting messy fingers at all! 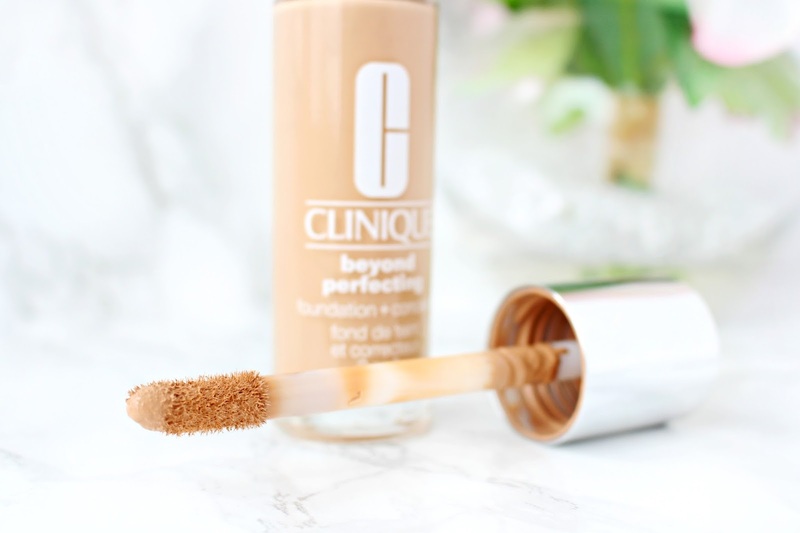 The applicator is designed to spot-conceal, but I prefer to keep it nice and clean for use across all of my face, plus it's housed in really nice quality glass container, who else loves a glass container?! 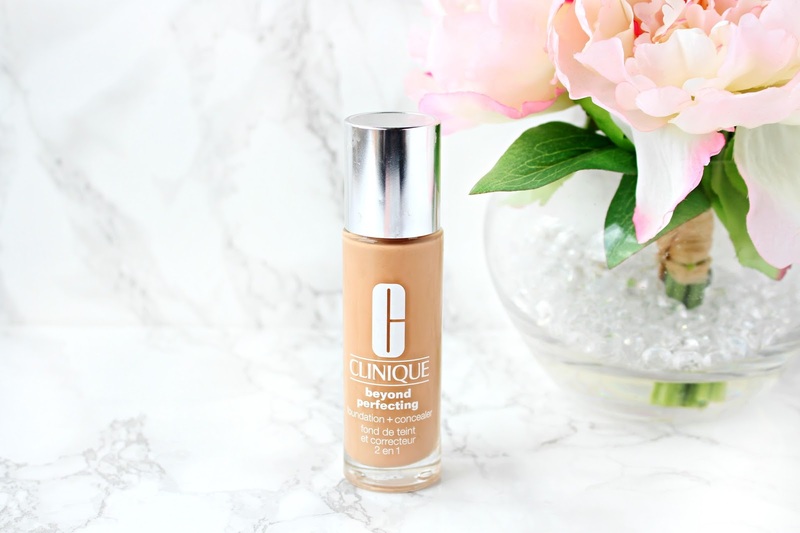 The formulation of this foundation is fantastic and I can really rely on it to stick around regardless of it's a busy day in the marketing office or whether I'm out and about running errands. I've even worn it for a full shift and then to the gym after ( I know you're not supposed too) but the fact it stayed on through a sweaty gym session is pretty impressive. Despite being medium-full coverage, this foundation does feel breathable on your skin and you are never left with a powdery or streaky finish. The shade I have is neutral and even though it's probably a shade or two up from my natural tone, it has been a great and very versatile shade during the summer months! Overall, I really like this foundation and over the past few months not many of my other foundations have managed to see daylight. It's £25 which I think is pretty reasonable considering this can be a concealer too! I oftern apply it to troublesome areas when I'm wearing a lighter foundation on the weekend. I would recommend this foundation if you're looking for a multi-tasker that you can rely on to stick around regardless of what you might have planned that day or night. I would love to hear from you in the comments section below! Have you tried this foundation, or is it something that sounds suitable for you? I ask myself, do I really need anymore skincare? and the answer is always No Yes. I love how my skincare routine relaxes me and helps to calm me down ahead of a busy day or after one. 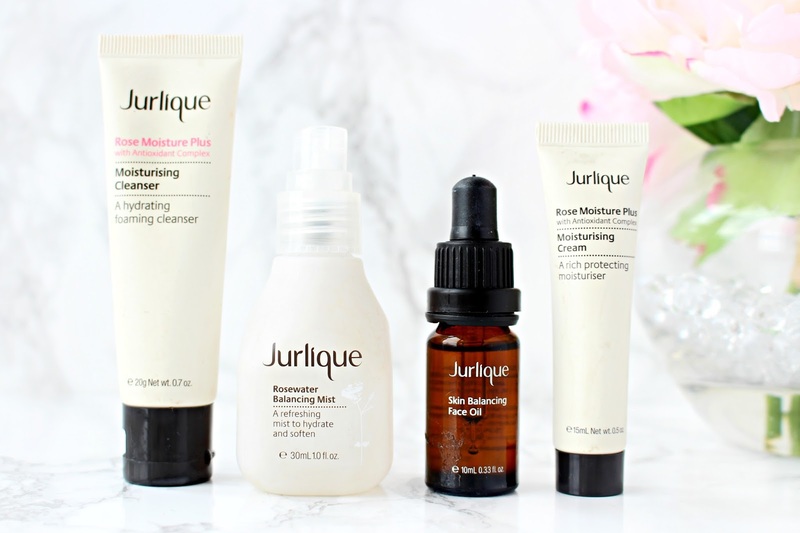 I have a list as long as my arms of products I want to try and most recently I decided to treat myself to the Jurlique Hydration Set, which contains the highly coveted Rosewater Mist! 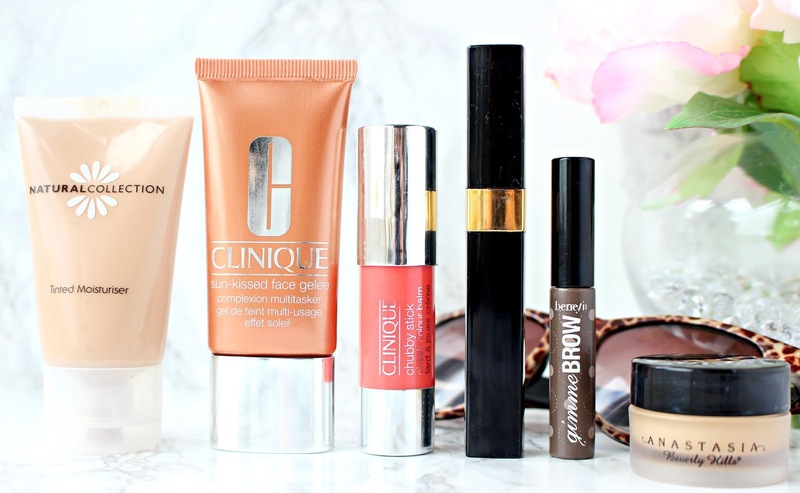 I've been using the products for about three weeks now and couldn't wait to tell you all my two cents and whether I had any particular favourites from the set itself. I hope you enjoy this review lovelies and I would love to hear from you in the comments section below. Described as a lightly whipped, high performance cleanser I was excited to see how my skin reacted to this foaming cleanser. I'm not usually a huge fan of foaming cleansers, as I find they dry out and aggravate my skin slightly. However, I've really been enjoying the Rose Moisture Plus Cleanser. It has a beautiful rose scent (Think fentimans rose lemonade) and lathers up beautifully dissolving dirt and impurities, whilst enhancing cell turnover with it's powerful antioxidant formula. Key ingredients include Rose Hip Oil known for its restorative, hydrating and balancing properties and Willow Bark Extract which is a natural form of salicylic acid. I'm actually heading to Dubai in three weeks and I'm definitely going to take this away with me to help keep my skin hydrated but balance at the same time. The Rosewater Balancing Mist has genuinely been on my wish list for over a year now! However, I'm pretty darn faithful to my Elemis Apricot Toner, so I never really felt the need to purchase this product by itself. I'm so glad that it was part of this Set and it certainly hasn't disappointed me! It's described as a balancing mist, which uses Marshmallow, Glycerin, Rose, Aloe Vera and Grapefruit Seed to leave the skin feeling refreshed, balanced and soothed. I love to spritz this either first thing in the morning or just after my cleansing routine whilst in the bath. I feel like when my pores are open that it's the perfect time to let this beautiful mist sink into my skin and work it's magic. I do love this, but prefer to keep it for pampering occasions opposed to using it in the same way as I use my Elemis Toner to finish off my cleansing routine and remove any excess cleansing product. Described as a high-performance moisturising cream, I would definitely class this as being a luxurious and intensely moisturising on the skin. It contains a powerful plant and antioxidant complex including Green Tea, Soy Proteins, Rose Hip, Avocado and many more beautifully moisturising ingredients to address signs of dehydration and ageing. I must admit this is the one product that has the least use, but it's not because I dislike the product at all. However, it's very rich and luxurious and in the daytime I tend to prefer a gel-cream formula like Clinique Moisture Surge, so this moisturiser is definitely more of an evening product or me! Ahh I love a face oil, especially this one! They are so luxurious, but more importantly balance my skin like no other. If my skin is ever playing up, I pretty much strip my skincare routine right back and just cleanse, tone and oil and within a few days my skin is back to normal! The first thing that I noticed with this oil was that the scent was different from the other three products. Key ingredients include Evening Primrose Oil, Macadamia Seed Oil and Marshmallow, which I think give this product it's slightly sweeter scent! I love that it's super lightweight, but still has a luxurious feel. It leaves my skin feeling velvety smooth and so far has helped to soften my skin and keep it feeling plump, especially when used consistently. Overall, this is a really great starter kit and the sample sizes are pretty generous too. If you're looking to try Jurlique out as a brand, but like me not too sure what to go for then this little set contains some of their hero products all for £35! I would love to hear from you in the comments section below - Have your tried Jurlique before, or are any of their products on your wishlist? Hope you are all keeping well? I treated myself to a three day weekend this week after litreally wearing myself out between one thing and another. 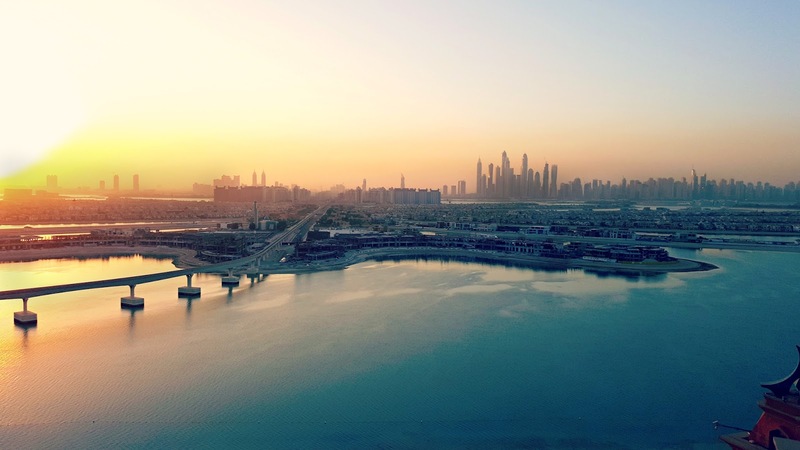 After putting out a Twitter poll last week my second most requested post was my five reasons to stay at Atlantis Palm in Dubai. Seeing as I'm heading back in three weeks time, I thought it would be a good idea to get it posted for you lovelies! 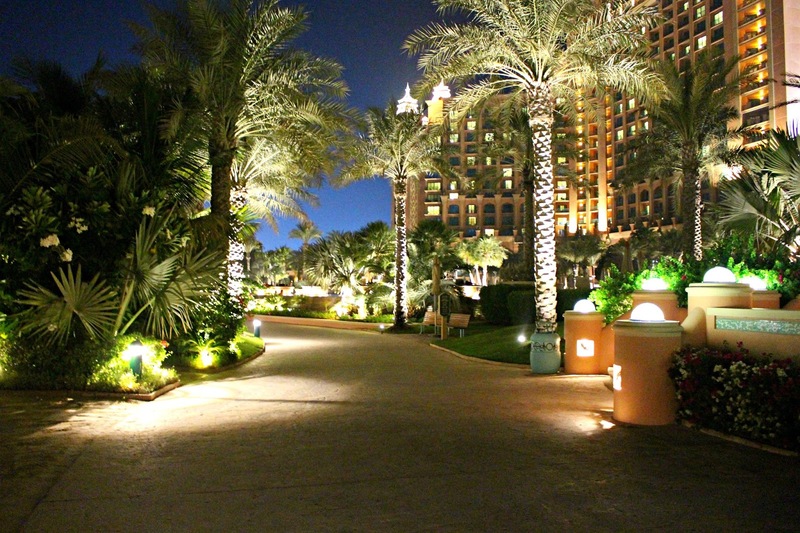 If I have ever come across a resort which has something for everyone it’s the Atlantis Palm. I’ve been lucky to stay at the Atlantis Bahamas a few times also, which is equally beautiful in its own way. 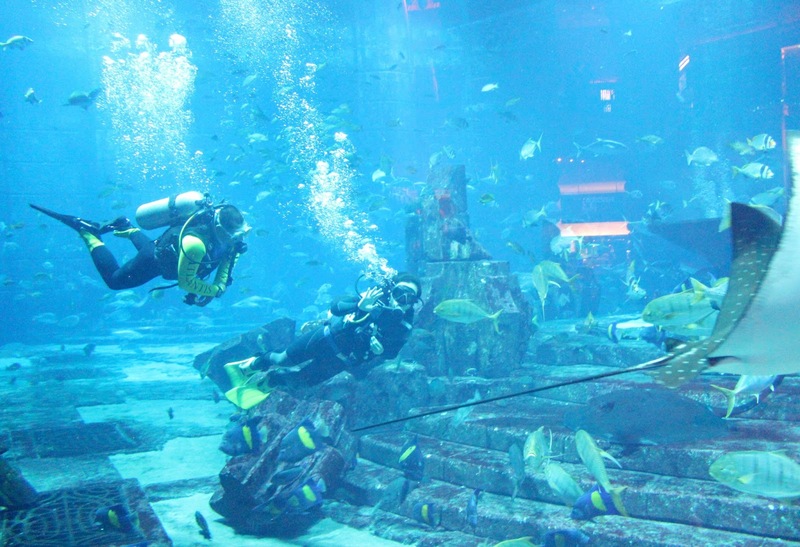 The Atlantis is a real gem in the Indian Ocean and last October was our first ever trip to Dubai. We were truly treated like royalty whilst at the Atlantis and they made our visit and engagement more special than I could have ever of imagined, pulling out all the stops during our stay! I hope you enjoy this post and I would love to hear from you in the comments seciton below. I don't believe there is a single room in the Atlantis that you wouldn't want to stay in. Everything from their Deluxe Rooms to their opulent Bridge Suite offer the ultimate luxury experience for your stay. 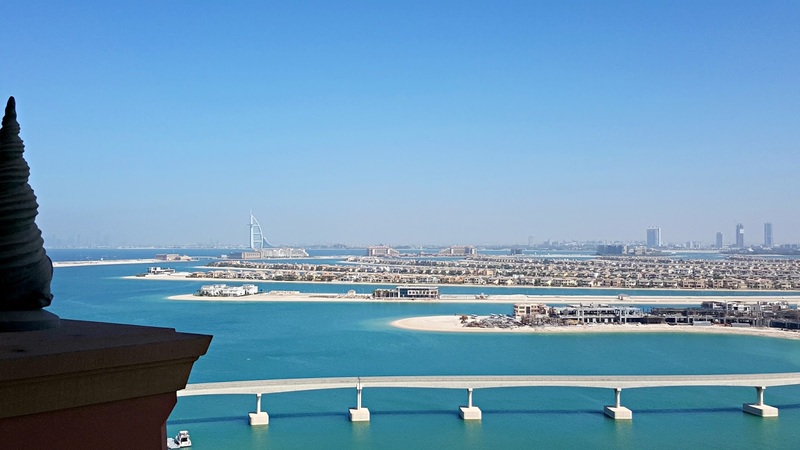 We were lucky to stay in a beautiful suite on the 17th floor looking over the stunning palm and the towering Burj Al Arab during our last stay. Featuring the best water park in Dubai Aqua Adventure is the perfect place for fun seekers and guess what.. It’s complimentary for Atlantis Guests.. amazing right?! If you’re feeling brave then take the Leap of Faith down a 60metre near vertical slide through a lagoon full of real sharks and an array of other beautiful sea creatures. It definitely took my breath away, so if you’re looking for something a little more relaxed head for the Lazy River, which spans the entire water park! There is also an amazing part of the waterpark perfect for young children - I wish I could take my niece honey, she would love it! Whether your idea of relaxation is lounging by the pool, feeling the sand run through your toes or enjoying a luxury spa treat, The Atlantis has it all. During my visit last year I loved nothing more than enjoying a real pineapple cocktail, catching a few rays and cooling off in the beautiful Atlantis Pool. However, from what I've heard the ShuQi Spa and Fitness centre is not to be missed and I will definitely be booking in when I visit this October. With over 65,000 marine animals you are truly spoilt as you meander through the lost chambers of the Atlantis Aquarium, which is complimentary to Atlantis guests like the water park. Last year myself and Daniel pretty much walked through every single night and with so many beautiful variations of sea life it certainly didn't get boring. 5. Dining – Perfect for even the fussiest of eaters! With 20 beautifully appointed restaurants the Atlantis truly does have something for everyone. My fiancé Daniel is probably one of the hardest people to feed and pretty much eats everything plain and in some cases doesn’t like certain foods touching (weird I know) but even he was in his elements, especially at kaleidoscope and the Shore bar. If you want to sample the BEST steak of your life then head over to Seafire. You won’t regret it. Overall the Atlantis resort is a luxury playground for holidaymakers of all ages! Whether you're looking to book that WOW holiday, or simply enjoy an action-packed family escape the Atlantis is the place to go for a luxury holiday. It is also in close proximity to the Dubai Mall and Burj Khalifa, which are two fantastic trips that you can take whilst in Dubai. If you're an adrenaline junkie then definitely book yourself into Skydive Dubai - Daniel did a skydive last year and absolutely loved his experience. My last and current vacation to Dubai have been booked through Virgin Holidays, who have provided great service each time. Dubai is a fantastic location if you're looking for great weather and the perfect mixture of a beach/city holiday! I hope you've enjoyed this review and I would love to hear from you in the comments section below, is the Atlantis a resort you would like to visit? Hope you're all having a super relaxing Sunday? Earlier on today, I decided to put a poll on my Twitter feed with a few blog post suggestions, as I love being able to post content that I know my lovely readers want to see. 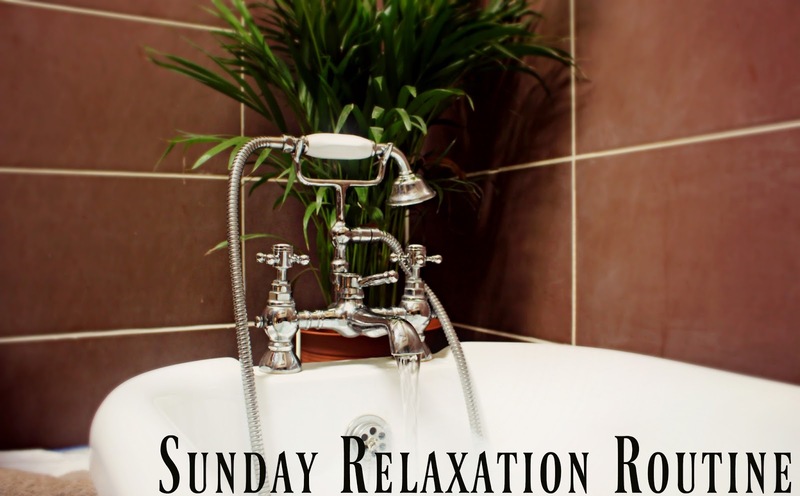 The overall winner was my Sunday Relaxation Routine, which I've actually been meaning to post for a little while now! I love Sunday as it gives me a chance to refocus and prepare myself for the week ahead, as well as being the perfect opportunity to pamper myself from head to toe. 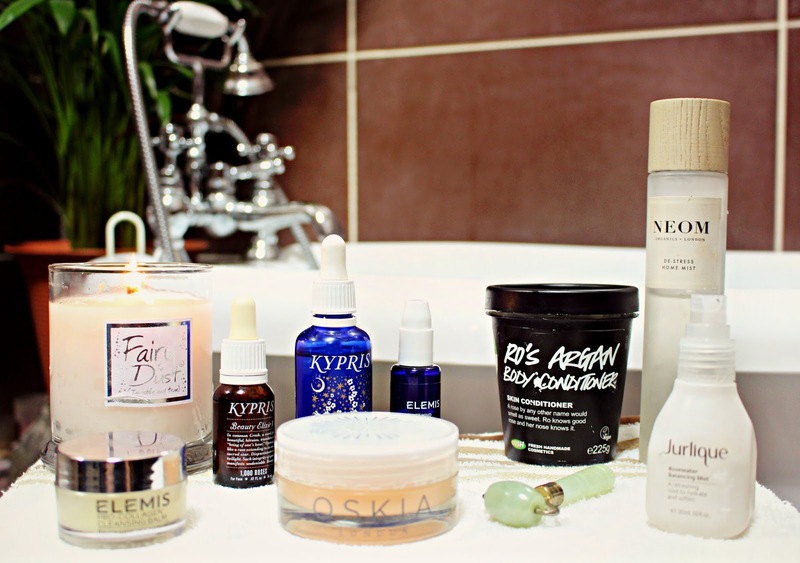 A few of you might know that I do suffer with on and off anxiety and sometimes on a Sunday I can start to feel a little overwhelmed, so this pamper routine is the perfect way to balance out my mood and fill my Sunday evening with lots of positive vibes! I hope you enjoy this post lovelies and I would love to hear from you in the comments section below. 90% of the time I will have a shower in my en-suite for quickness, but when I'm in need of some serious relaxation I always head to the bath. For me a bath wouldn't be a bath without some kind of treat and actually one of my favourite bath treats is a generous helping of Radox! Tonight I used the de-stress one, which is the perfect way to create a soothing and very bubbly bath. I also love to use LUSH products for my relaxation routine, but right now I'm all out! I'm really into self-help and creating a peaceful mood and atmosphere is a must when it comes to preparing myself for the week ahead. I work in a very high paced marketing/hospitality environment so it's really important for me to settle myself before the week ahead. One of my all time favourite products is the NEOM De-Stress Home Mist which 100% natural and includes 23 of the purest essential oils including lavender, jasmine and Brazilian rosewood to instantly reduce your stress levels. I also light a candle and I'm currently loving Lily-Flame Fairy Dust, which is the ultimate girly pamper evening scent! Finally, I put on some relaxing spa music from YouTube and put on my mood lit Hymilan Rock Lamp (which I will be reviewing separately) and I'm good to go! My favourite part! 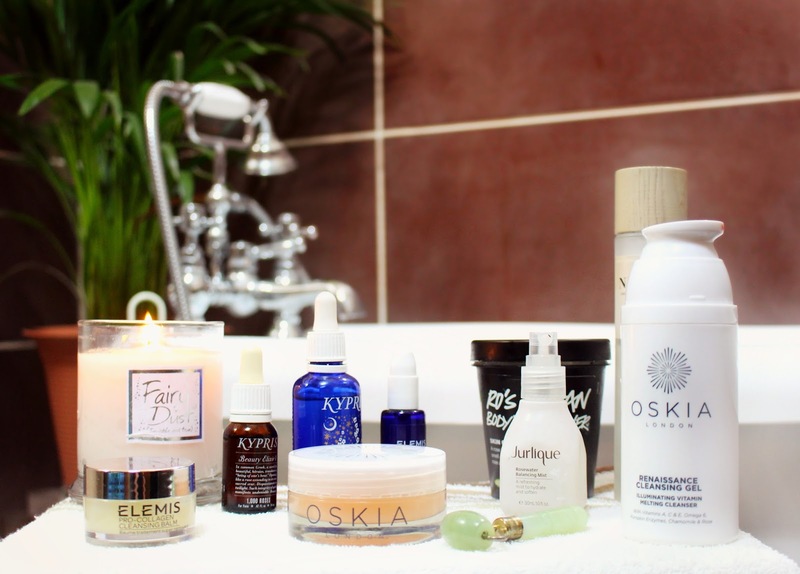 I absolutely adore skincare, as most of my readers will already know. So on a Sunday I make the most of my products and treat my skin to a full on facial. I love everything from the different textures to the scents and after my skin is left feeling truly amazing! I start off with my Elemis Pro-Collagen Cleansing Balm - My Spa in a jar! or my Oskia Renaissance Cleansing Gel, followed by my Oskia Renaissance Mask which is a buttery balm designed to boost radiance and reduce the appearance of imperfections using Natural Fruit Acids. After taking the mask off with hot flannel I spritz my face with the Jurlique Rosewater Mist full of Marshmallow, Glycerin, Rose and Aloe to intensely hydrate, balance and soften the skin. 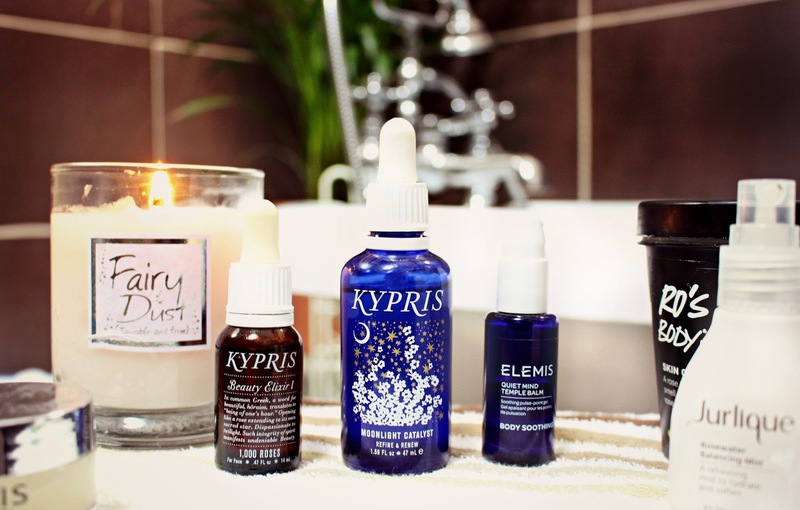 Last but definitely not least I load my skin up with the Kyrpis Moonlight Catalyst and 1000 Roses Beauty Elixir, which are two of the best products I have ever tried and layered on top of each other my skin is left in it's best condition. To help them sink in I use my Jade Roller around my eyes and also the central parts of my face to eliminate toxins and improve blood flow, which is especially good to reduce dark circles under your eyes! Once I'm done with my skincare treats I usually opt for my LUSH RO'S Argon Body Conditioner which is an utterly delicious body conditioner that can be used either in the shower or bath! It's full of nourishing argon oil, vitamin E and Brazil nut and almond oils to leave you with supple and radiant skin. I'm not the best when it comes to body care, but I love that this can be used on wet skin as I tend to forget to condition my skin once I'm out of the shower or bath. To finish off my relaxation routine I apply some of the Elemis Quite Mind Temple Blam to my temples, delicate and the back of my neck to leave me feeling completely relaxed at at ease and ready for the week ahead. So that's my Sunday Relaxation Routine, which I hope you all enjoyed. I have a pretty exciting month coming up and I'm going to be snap vlogging it all, so make sure you follow me at SC: JewelBeautyBlog If you want to listen to beauty rambles and see lots of behind the scenes and vacation snap vlogging! Hope you're all keeping well? If you follow me on social media, you will probably know I've recently booked a holiday with Daniel to go back to Dubai and I couldn't be more excited! 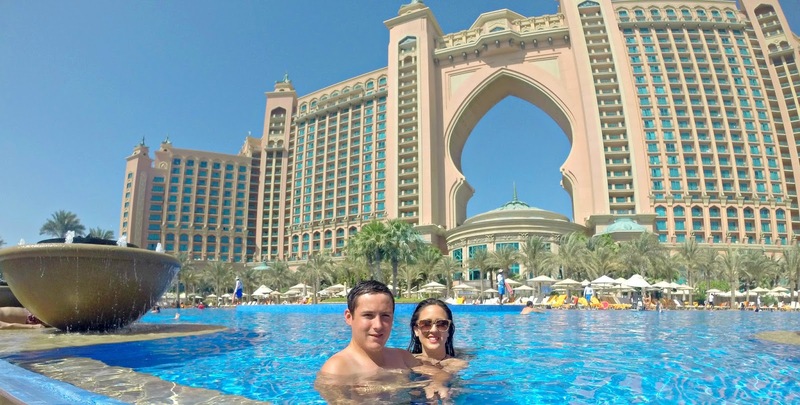 We got engaged at the ATLANTIS last year and even though it was always our intention to celebrate our one year anniversary in Dubai, it seemed that work commitments were more than likely going to get in the way for both of us. I have been lucky enough to visit the Atlantis in the Bahamas a few times and the Atlantis Palm did not disappoint. The hotel staff made us truly feel like royalty back in 2015 and I'm so excited to go back and enjoy another blissful holiday in paradise. Because we hadn't booked up early like we had hoped prices for Dubai literally sky rocketed, but luckily about two weeks ago there was a flight sale, which brought the overall price down by a few hundred pounds per person! I thought I would share a few of my long-haul beauty essentials in preparation for the flight, which is around 7 hours and 30 minutes. 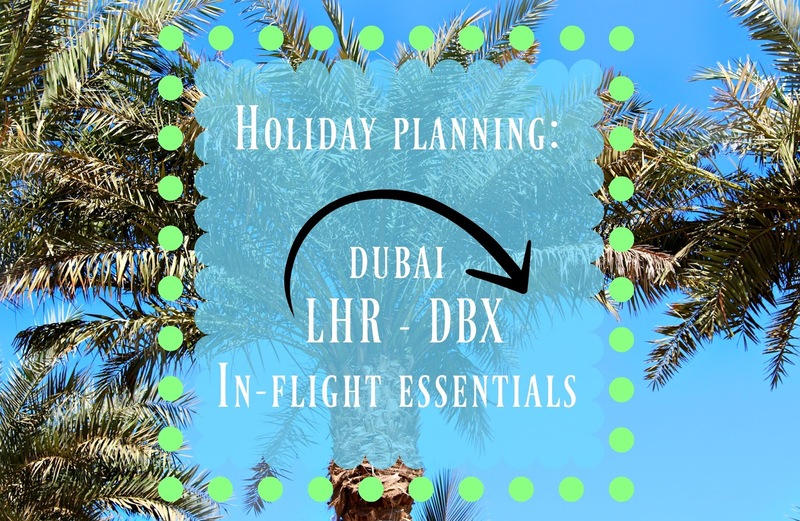 I will be following up with two more posts on what to pack for a holiday to Dubai and also some of my favourite places to visit and stay. Love them or hate them, When you're 30,000 + foot up in the sky they are a must. Perfect for removing make-up, freshening up or wiping away any spillages. 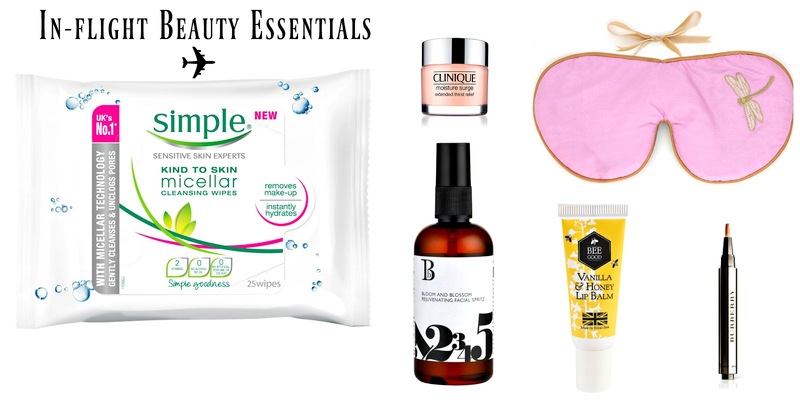 I love the Simple Micellar Wipes, which I find work really well and leave my skin feeling completely happy. My out flight is a night flight, so as soon as the lights dim my make-up will come off. This is where your sample size products will hopefully come in handy. I have a stash of hydrating moisturisers including a handy sample of my favourite Clinique Moisture Surge Treatment. Flying can seriously mess around with your skin, so keeping it hydrated is key to staying comfortable throughout your flight, especially when flying long haul. I will definitely be taking my Clinique Moisture Surge on the plane with me, as it can be used as a moisturiser, a midday boost over makeup, or as a super hydrating mask. I've always been a huge fan of spritzing my face, especially on a long flight, which can make your skin feel tight. The Bloom and Blossom Rejuvenating Facial Spritz has a total of 11 all natural ingredient, which are known for reducing dark circles, lines and giving you a fresh and brightened complexion. Most of my readers know that sleeping isn't my forte, especially not on a long haul flight. An eye-mask is a great way to block out the light and to keep jetlag and bay. The Holistic Silk Mask is infused with lavender, which is the perfect way to help you get a few Zzz whilst flying! Like your skin, your lips will suffer whilst flying, so I would always recommend taking a lip balm on a flight with you even if it's not long haul. I'm currently obsessed with the BEE Good lip balm, which has the perfect consistency and is not at all sticky making it your best friend whilst up in the air! Last but not least, I always carry on a highlighter/concealer to help rejuvenate my peepers after a long flight. I will usually have a sample size of eye-cream somewhere in my carry on, but for me there is nothing worse than looking tired... after all the eyes are the window to your soul! The Burberry Concealer has been a favourite of mine, since I purchased it before my trip to Dubai in 2015! It's light yet perfecting consistency makes it perfect for refreshing your complexion after long flight. I hope you have enjoyed this post lovelies! I forgot to include that I usually take a de-stressing roll on for my plus points, as I get pretty nervous whilst flying - Does anyone else feel the same? If so, I would seriously recommend trying the NEOM Real Luxury De-Stress roll on. I would love to hear from you in the comments section below, what are your in-flight essentials? I will also be posting about what to pack for Dubai, as well as my favourite places to visit and stay whilst there!